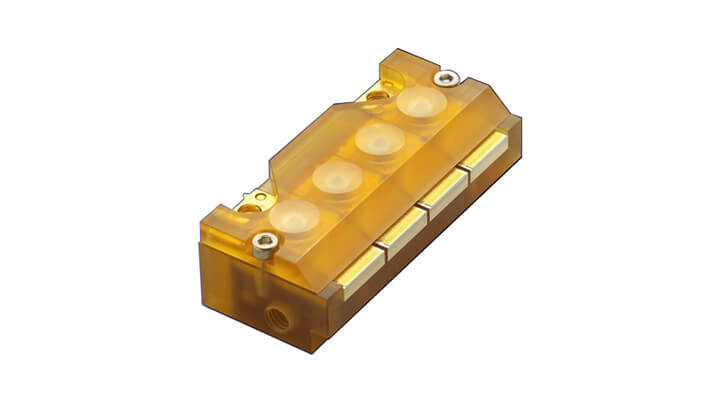 Monsoon horizontal array modules are built with high-power laser diode bars to provide a distributed high-intensity line beam. Up to 6 bars can be placed side by side in a compact package to provide modular flexibility to match the application requirement. A key feature of Monsoon horizontal array modules is active water cooling that enables the low thermal resistance package needed to achieve high power levels and reliable CW operation >10,000 hours. Standard product configurations include 4, 5 and 6 bars in a horizontal array. Optionally, the Monsoon® horizontal array modules can be equipped with FAC and SAC lensing as well as custom beam shaping. Other customized configurations or wavelengths are available upon request.